It’s often been said everyone’s Irish on St. Patrick’s Day, but perhaps the reality is that everyone’s Irish when listening to Irish music. 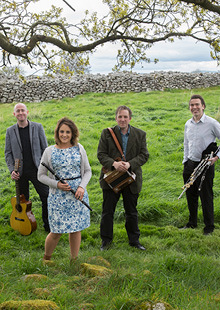 The musicians of Danú, whether they’re singing in Irish or English, blend beautifully crafted vocals with the unmistakably Irish sounds of flute, tin whistle, fiddle, uilleann pipes (Irish bagpipes), button accordion, and bodhrán (hand-held, Irish drum). Their sound and tunes transcend time, place, and ethnicity, drawing listeners home to a place many have never actually been.